Tonight’s guest on Beyond Worlds is Richard ShadowFox! ShadowFox has been busy making Tarot decks for the last 11 years, and his work is impressive – the Legends of Rock Tarot, the Minimal E. Stick Tarot, the Tarot Progressive, the Ultimate Tarot, the ShadowFox Tarot, and his newest, the Tarot Deck of Heroes. And he’s not done yet … in 2013 he’ll be releasing the Tarot of the Night, followed by the Chromillennium Tarot and the Feminine Devine Tarot. That’s a lot of decks for one man! I can’t wait to hear what he has to say about them all. 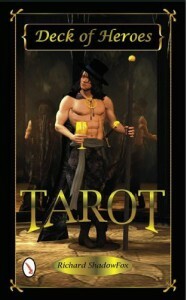 Or at least what he has to say about his latest, the brooding and powerful Tarot Deck of Heroes. Join Donnaleigh de LaRose and I live in the chat room. Or call in at (646) 200-0765. It’s sure to be an interesting show. You are currently reading Beyond Worlds with Richard ShadowFox at The Tarot Room.